Admit it, we’re all guilty- we buy that electric toothbrush in the shop, promised a million and one cleaning actions, and then we just keep on using that same device over and over. After a good few months, there’s no correlating limp and soggy offering in your bathroom with the super-duper whitening cross-action power unit you bought. That’s why today we are focussing on Oral B’s toothbrush replacement heads- because trust us, you do need to replace that head over time, no matter how good the toothbrush. Why Would I need Oral B Toothbrush Replacement Heads? Over time, the delicate bristles and other cleaning features on even the best electric toothbrush begin to wear down. In order to maximize the clean [and the cavity prevention,] you receive from your toothbrush, it’s imperative you keep the heads in pristine working order- and swap them out regularly when necessary.Check more on toothbrushes here. Oral B makes all of their heads interchangeable with their bodies/wands, so it’s simple enough to change styles should you wish to try a new head. What else can I do to ensure I always get the best clean? There are few things you can do before swapping to an Oral B toothbrush replacement head, and the most important of these is keeping the head of your existing brush sterile. Everyone has their own preferred method for this, but a gentle clean under the tap regularly will ensure that day-to-day grit and food particles that otherwise would become stuck in the bristles are swiftly removed. In addition, you should get in the habit of leaving the bristles [don’t soak the rest of the mechanical head, prop that out of the water] in a sterilizing solution. If you prefer home-grown remedies, salt water or vinegar will sterilize well too. This will help keep the bristles clean, particle free and disinfected. You should also learn the correct brushing style for your electric toothbrush. Some are specially designed for up and down movement, where others need the user to rotate the head in soft circles. Using the correct brushing style will maximize the life of the head as well as the results you get. Don’t press too hard or you could damage both the bristles and your gums/teeth. 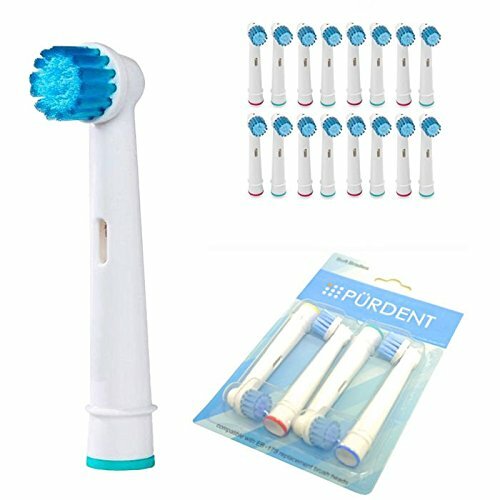 What Oral B toothbrush Replacement Heads Are Available? This head is the current flagship of Oral B’s ranges. While its bristles appear to be crazily arranged, this is in fact, the ‘cross action’ referred to in the title. It can reach up to 300% of the bacteria of a normal manual toothbrush and is designed to penetrate into the gaps between teeth and the gum line. This standard head is the perfect choice for a beginner who is not yet used to the action of an electric toothbrush. It’s comfortable and ideally designed to remove plaque along the gum line. The Flossaction toothbrush uses ‘Micropulse’ bristles to target the interdental area. Despite the name, it is intended as an add-on to, not a replacement for, manual flossing. This head is designed with a unique whitening cup to gently remove stains over time. It can be used with or without a specialized toothpaste. Another Oral B replacement toothbrush head that does exactly what it says on the box, the sensitive clean head is perfect for those whose gums bleed or hurt easily. Orthocare Oral B toothbrush replacement heads are specially designed for those who wear braces, to ensure a thorough but non-damaging clean around the equipment. Despite a rather ominous name, this is actually a very simple brush. 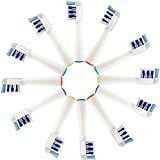 Designed more like a ‘normal’ toothbrush then other heads, it will help you ensure a thorough mouth spring cleaning with 3 different cleaning zones. This Oral B toothbrush replacement head design features two rotating heads to ensure a perfect clean even in hard-to-reach spots. Oral B toothbrush replacement heads are widely considered the best dental brand in existence today, and as can be seen from the wide range of Oral-B toothbrush replacement heads they offer, they have something in their range for everyone looking for a quality, deep dental clean. 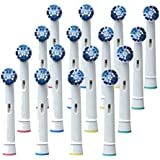 You can buy electric toothbrush replacement heads at Amazon as they offer free shipping and have the most to choose from. Liked my post, share on social media, have any question you`d like me to answer,leave me a message below as I^d like to know how you decide which toothbrush head to buy. Great post. To be candid I didn’t know there were replacement heads specially designed for those who wear braces. Neither I nor my spouse wears them, but we suspect our orthodontist is going to prescribe braces to our four-year old daughter. I usually buy standard replacement heads for my 16-year old niece who wears braces. I guess I learned something new today. if you chose the right electric toothbrush heads,your niece should have no problem with them. Just in time…. What a great article with so much detail. I am a present owner of an Oral-B looking for a replacement and Voila. I’m used to the traditional brush, but I’ve been looking into getting an electric. I’ve heard that they can get your teeth much cleaner than a manual. As far as cleaning the electric brush, if someone were to use vinegar, would that leave an aftertaste one the brush? What would be your first choice for a brush cleaner? Hello Paul,electric toothbrushes,just like manual toothbrushes are easy to clean.If you chose to clean with Vinegar as you do,how about running warm water to rinse after you`ve used vinegar to remove the after taste.